I hope you all had a great holiday and ready to ring in the New Year soon. The DT is compiling their favorite card of 2017 to share and today is my day to show and tell. :) I will tell you that choosing just one card for an entire year is rather difficult. I love so many but did settle for this one because it covers a few of my favorite things - love and coffee. Using some patterned paper from the Hugs and Kisses collection and the puffy cloud border die, I created the backdrop for the floating coffee mug. The set of Love and Coffee was used for the main image and sentiment before completing the look with a few hearts stamped around. A super clean and simple card to express what you really only need! You can find the original blog post HERE to see more about this card. It is always fun to go back and see some of your older projects and pick out a few you really enjoyed. I know I tend to forget about some of the cards or projects I have done until I peruse through my albums and say, "Oh yeah!! I forgot about that one!" hahaha! It's a great way to refresh your mojo a bit and do some new creations possibly from the old. Thanks for stopping by and I wish you all a safe and joyous New Year! See you in 2018! It's hard to believe Christmas is a short 18 days away and I still don't feel complete with things getting done. It will get there though! With all the hubbub of the holidays and wrapping of presents, I am needing tags all the time. This week's sketch challenge on the YNS Challenge Blog was perfect to make another one using the sketch as well as one of the super cute mini stamp sets YNS has in the store. I am using Reindeer Smiles. For the tag, I used the Stitched Scallop Rectangle set and added some patterned paper. The image was stamped and colored in with Copics before being cut out using the coordinating die. I added the sentiment and eyelet in the corner to hold the twine. It was finished with some gold cording for the bow. 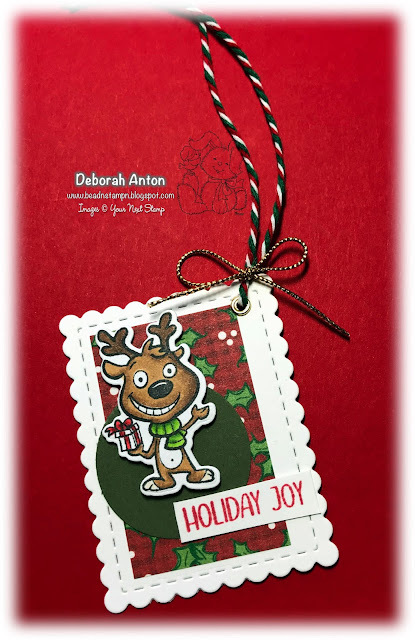 I love making tags and these mini sets in the store are perfect for using on tags. Don't forget to stop by the YNS Blog to see the other fun creations the team has put together. Thanks for stopping by and hope you all have a fabulous, stress-free weekend!